Miniature Dachshund the small dog of the breed. The miniature dachshund may be the small dog of the breed, but they make up with it in attitude. Some have described them as a big dog, dressed up as a small dog and they sometimes think they are a Doberman. There's an old saying you don't decide to own a dachshund they decide to own you, this is so true when I think about the mini dachshund. Once they decide your the one for them, then you have a great little companion for life, they just love being with people. Although sometimes they do try to make their own rules. These little dogs can do well in homes with small yards, large yards or even no yards, like an apartment. Mini dachshunds can also make great companions for the cat in your household, as long as you introduce them slowly. Chest measurement in the range of 12 to 14 inches (used to assess size in Germany and some other countries). These measurements are as at maturity (12 months old). These measurements may vary from country to country. The miniature dachshund is not a separate classification but competes in a class division for 11 pounds and under at 12 months of age. This small lighter dog was bred mainly to hunt rabbits that were destroying crops, their size enabled them to access rabbit burrows.They are surprisingly good athletes for their size and some owns love competing in earthdog trials with their mini doxie. you have to watch this you-tube video, it's so funny. "Tweenie" as they are more commonly known are between 12 to 15 pounds (5.5 - 6.8 kg), therefore they are neither standard or miniature size. They may not make a great show dog but they do make a great pet. Tweenie puppies runs a much higher risk of suffering from inherited (genetic) diseases, chronic poor health (particularly skin and allergy problems). The dachshund has a long compact well muscled body with prominent fore chest showing the strength and power needed to hunt above and below ground. In spite of his short legs compared to the length of his body his movement should be free and well balanced not showing any awkwardness. They still make me laugh when they run fast, their little legs going nineteen to the dozen. The doxie has solid strong legs, useful for digging, which most of us find this out, so be prepared. Their hind paws consist of four toes if the dewclaws are removed, pads are tough with black nails.Front paws are larger than hind with five toes as dewclaws are not usually removed. Their head is tapered with finely formed muzzle, very useful for getting under blankets and any other hiding place. Their nose with open nostrils, sets off the eyes that are oval, medium sized and dark rimmed, showing a pleasant expression. The large floppy ears are set near the top of the head. The tail is set high and is long and tapered,this was often used to pull the dachshund out of a tunnel. The dachshund dog’s skin does not have excessive wrinkling and is elastic and pliable helpful in wriggling through tight spaces. Is the miniature dachshund the right dog for you ? If you have a house which has lots of steps, then the miniature dachshund may not be the dog for you. Like all dachshunds you have to watch their weight and they need regular exercise. 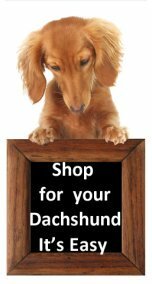 If you are out all the time, these little dogs may not be for you, as dachshund‘s are very social dogs, they love the people in their lives, actual they don’t think of themselves as a dog. There are smooth haired, long haired and wire haired mini dachshunds, sometimes the personality of the dog can be different depending on the type of coat, but often it just depends on the dog. Some people just have to have a miniature dachshund, they are the most popular size. I believe they are more than just a dog. Visit our Miniature Dachshund Breeders if you think this is the doxie for you.